I think my dual IQs are up and running now, but not without problems! I installed Spectravue on two different folders on my new Fujitsu-Siemens. Fired up the first one...no problems but when I increased the demod span from 150 to 190 kHz audio was distorted. I fired up IQ no 2 and distortion was even worse! Was it the sound board? I had a Creative USB board around so I installed it. No cigar. I tried to record an RF file. I got the first session of Spectravue to record, but not the other. So what was it? Vista, the OS, known for its compatibility problems? Finally I emailed Pieter at RF Space, who had managed to run four sessions of Spectravue simultaneously. Surely, the PC wasn't too weak? His initial response wasn't too optimistic: "I really don't know what to tell you..." but then he asked if both IQ USB contacts were placed at the same USB controller, and if so, try to move one of them to another controller. Well, both USB contacts were placed at the same controller at the back of the PC, and I moved one of them to a contact up front. And as if by magic, the problem was gone! I can now demodulate, and record RF from both IQs without problems, at a full 190 kHz. Now, there is a problem. 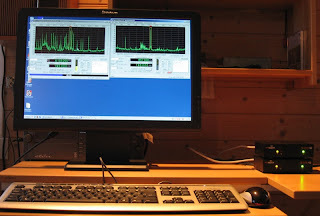 The beautiful 19" widescreen LCD does emit RFI on a small portion of MW, from 629 to 642 kHz. I can turn the display off and the problem (measured to -105 to -120 dBm) is gone. I adjusted the brightness which reduced the problem somewhat (and it was much too bright to begin with). You can see the RFI on the picture, to the left of the centered signal at 657 kHz on the Spectravue running to the right. Now remains to see if the sessions run stable over a long period of time. The combined CPU strain is rarely higher than 50% so there should be plenty of overhead for running other programs like a browser or a word processor. One more word on the PC: The Scaleo J is a very quiet PC and that is quite important to me. I don't like high-speed fans running all the time. Looks promising, despite some deep worries at the beginning. A Fujitsu-Siemens Scaleo JA desktop PC with an AMD 3800+ processor, 1 GB RAM, 410GB HDD and a 19" Wide-Screen LCD from Lenovo. Well it was supposed to have 410 GB (1x250 + 1x160 HDDs) but came with a sole 320GB hard drive. Oh well, that will be sorted out. I also bought an Asus Nvidia 7300GS graphics adapter with 256MB in-board for better graphics performance. Since I didn't aim for any high-end stuff, I got all this quite cheap. The PC is remarkably silent. The OS is Vista Basic. I had preferred XP though. I installed Spectravue and it ran without problems, though with no radio connected. And I got my no 2 SDR-IQ together with the enclosure for no 1. The enclosures are excellent build quality; quite thick and heavy. Good rubber feet with friction. I like that. The antenna feedline coming up from below puts a lot of tension on the radio and a very light box with plastic feet is likely to slip. The picture shows the enclosures stacked though the upper box has nothing inside. So far! Next: Taking it all to Kongsfjord and setting it up. I bought my first H320 20 GB digital audio player (DAP) last autumn, and another half a year later. I now have two H320s and two H120s. For those unfamiliar with the iRiver range of DAPs, the H320 is basically an H120 with better navigation tools and a colour LCD. You may run across iRiver DAPs named H140 or H340 - they are identical players but with a 40GB HDD instead of 20. The H320 works fine out of the box for recording DX. However, the Rockbox firmware changes it to an excellent recorder! Rockbox is an open source replacement firmware for mp3 players. It runs on a number of different models, including some iRiver DAPs. With Rockbox, I can engage a configurable pre-recording buffer, up to 29 seconds, never again missing an identification because the recorder wasn't running. I can store recordings as MP3, in various bitrates, or WAV, in different sampling rates, and the files I record are named with date and time. The syntax is yymmdd-hhmmss. The H120 can do basically the same, except it has no date/time function so the files are named rec_0001 etc. Another handy Rockbox feature is that you can choose to auto-split files by a predetermined time or file size. That way, long recording sessions are split up to manageable file sizes. The splits are seamless. I have not found a way to schedule a recording though. The DAPs can be configured in many ways, including font size and appearance of the playback display. Unfortunately, the recording display can't be changed, and the font size is rather on the small side. Also, the H320 colour display turns B/W which is of no big concern for me. Many H320s are available on Ebay, quite attractively priced. Beware that the internal battery may need replacement, and that the switching charger is likely to impose RFI on your receiving system. A stabilised 4.5 - 5.0 PSU may be needed. The iRiver user forum Misticriver has descriptions on how to replace the battery (costs less than USD 30 from iPods99.com). Beware also that H320s and H120s with US firmware need to be flashed to European firmware before installing Rockbox. On the picture, both recorders are set in idle recording mode. The language is set to Norwegian. Unfortunately the photo did not give credit to the H320 (left) display. You will note that the H120 is also labelled iHP-120. One of the most common East coast stations, but I've had difficulties obtaining a verification from this one. Brief email from Keith Durnford today confirmed a 2004 reception and made way for a small celebration as it was my Canadian MW verie no 180. 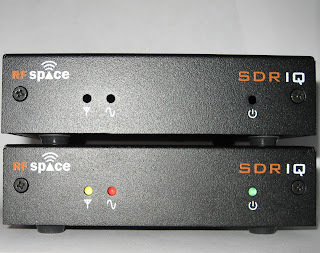 After having had an RF Space SDR-IQ on the test bench for a few months, I decided to buy another . Most of my future DX will probably be done from that monitoring station. To host these two gems, I have ordered a new Fujitsu-Siemens stationary PC with a wide-screen LCD monitor. Hopefully, all the parts will arrive within the end of next week. I will update the blog as the work progress. I'm a very modest "Country Hunter" and after 35 years I still hadn't verified Chile... so I decided to end the embarrasment and on May 17 I found CVC LaVoz' Spanish service with a fair signal on 17680, albeit mixed with RdP Internacional. Some nice ID's were recorded and sent to the station via email. Today I received a scanned, full-data QSL card by email.